Continual commitment to improving patient care leads United Regional to acquire the advanced technology of Mazor Robotics Renaissance Guidance System, a system transforming spine surgery. 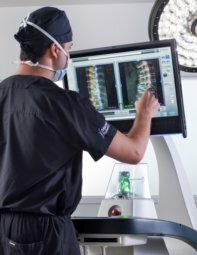 Neurosurgeons use the advanced 3D planning software before surgery to create a unique surgical blueprint, which is specific to each patient’s anatomy. 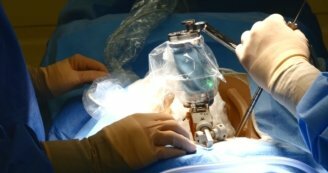 In fact, the robotics technology has been clinically validated to ensure 1.5mm accuracy for increased patient safety compared to freehand spine surgery. A patient will have CT images taken of his or her spine in preparation for the procedure. The neurosurgeon will use the advanced 3D planning software with the patient’s CT images to create a unique surgical blueprint, which is the ideal surgery for that patient’s condition. This also provides increased safety and precision since it allows the neurosurgeon to plan ahead, before entering the operating room. In the operating room, two fluoroscopy (low-dose X-ray) images will be taken of the patient’s spine, from the back and from the side. These images are merged together with the previous CT images by the technology’s advanced 3D planning software, creating a unique 3D surgical blueprint to guide the neurosurgeon according to the personalized preoperative surgical blueprint. The neurosurgeon will then dispatch the guidance system in succession to each anatomical site planned on the preoperative surgical blueprint, working on each one to complete the operation with the greatest accuracy and safety.